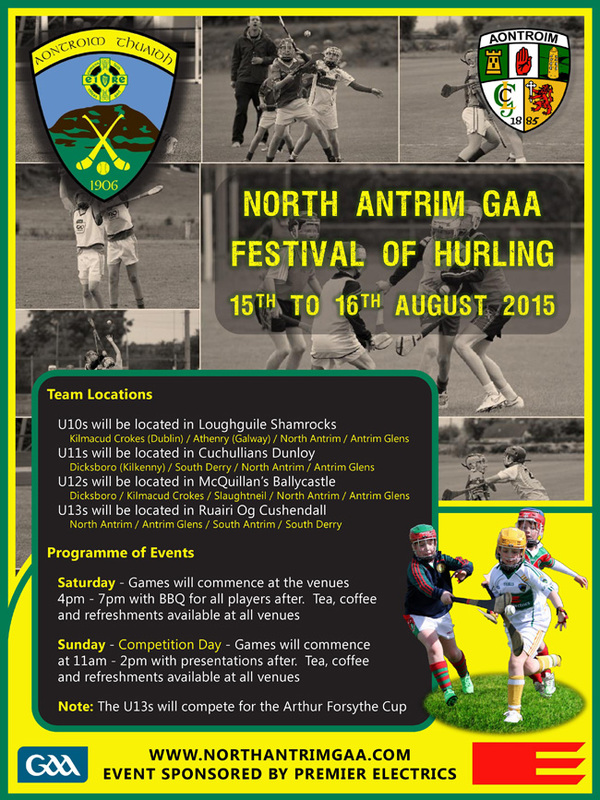 The North Antrim Festival of Hurling will be held on Saturday 15th and Sunday 16th August. Teams have been invited up from Dublin, Galway, Kilkenny, Derry, and across County Antrim for the 2 day event. North Antrim started the North Antrim School of Excellence earlier this year with an aim to promote Hurling and further develop our young players within North Antrim from U10 to U13 level Division 1 and Division 2. We travelled down to James Stephen’s GAA Club in County Kilkenny on 2 occasions earlier this year with our squads and decided it was now our turn to host a sizable event for the Under 10 to Under 13 age groups. The boys have been out training on several occasions with the County and Club Coaches in preparation for the day. Due to the numbers attending the event it has been split across 4 venues namely Loughguile, Dunloy, Cushendall and Ballycastle with each venue hosting a particular age group. Saturday will see all the games commence from 4pm to 7pm with BBQ for all players after. Sunday will be competition day from 11am to 2pm with all teams competing for a place in the various finals to win trophies and medals. The U13s will compete for the Arthur Forsythe Cup. Everyone is very welcome to attend the 2 day event, tea, coffee and refreshments available at all venues. Click here to see the teams. The North Antrim Festival of Hurling has been kindly sponsored by Premier Electrics. Saturday – Games will commence at the venues 4pm – 7pm with BBQ for all players after. Tea, coffee and refreshments available at all venues. Sunday – Competition Day – games will commence at 11am – 2pm with presentations after. Tea, coffee and refreshments available at all venues. Note: The U13s will compete for the Arthur Forsythe Cup.